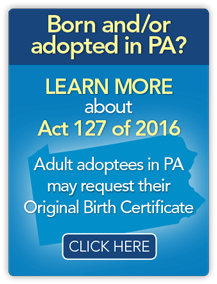 In 2014, the State of New Jersey enacted legislation which allows access to original birth certificates for individuals who are adopted. 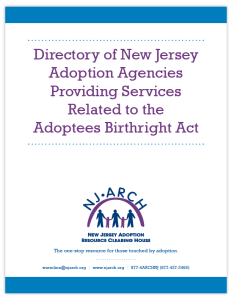 Starting January 2017, the New Jersey Adoptees Birthright Act will give adult adopted persons who were born and/or adopted in New Jersey the right to obtain a copy of their original birth certificate (OBC) upon request to the Registrar of Vital Statistics. At any time, birth parents whose child was born and/or adopted in NJ may indicate their preference regarding contact – either directly, through an intermediary or no contact at this time. Birth parents may change their preference at any time in the future. Birth parents whose child’s adoption was finalized before August 1, 2015 had until December 31, 2016 to request removal of their identifying information from the copy of the OBC sent to the adopted adult. Birth parents may revoke request for removal at any time. Visit New Records System for Birth Parents, Adult Adoptees on the Department of Health, Office of Vital Statistics and Registry website. To request related forms by mail, call 609-292-4087 Extension 8.
a. He or she is an adopted person. b. He or she is a direct descendant (e.g. 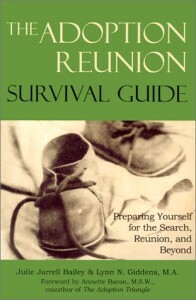 children, grandchildren, great-grandchildren), sibling, or spouse of the adopted person. c. He or she is the adoptive parent, legal guardian, or other legal representative of the adopted person. d. The requestor is an agency of the state or federal government, and is requesting the document for official purposes. Birth certificate application forms, proper proof of identity, proof of relationship and/or proof of name change, such as marriage cert for married woman who changed her surname, and payment must be mailed in to the NJ Department of Health, Office of Vital Statistics and Registry. 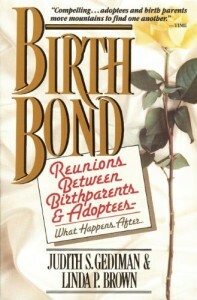 A birth parent of an adopted person may submit a Contact Preference form to the State Registrar indicating their preference regarding contact. The State Registrar shall require a birth parent who submits a document of contact preference to simultaneously submit a completed Family History Information form, which shall include medical, cultural, and social history information. The birth parent may change his or her preference at any time by submitting a revised document of contact preference. Note: The Registrar shall request a birth parent who indicates a preference for no contact by the adopted person to update the family history information every 10 years until the birth parent reaches the age of 40, and every five years thereafter. Click to download Contact Preference Form, Family History Form and Redaction Forms. Updated, 1/1/2017: Birthparents had the opportunity until December 31, 2016 to redact (remove) his or her name and/or other personal information from the copy of their child’s original birth certificate that will be sent to the adoptee or authorized requester upon request. Note: Birth parents who submitted a Contact Preference Form, Family History form and/or Redaction Form may update these forms at any time by contacting Vital Statistics at 609-292-4087 Extension 8 . 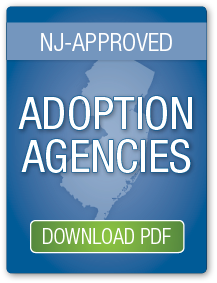 The web page created by the Department of Health, Office of Vital Statistics and Registry called “New Records System for Birth Parents, Adult Adoptees” can be found at http://www.state.nj.us/health/vital/adoption. To request these forms by mail, call 609-292-4087 Extension 8. Click here for Frequently Asked Questions (FAQ’s) regarding changes in the law related to Adoptees and Birth Parents. You will find the act described above, Public Law 2014, Chapter 9 (P.L. 2014, C.9), at http://www.njleg.state.nj.us/2014/Bills/PL14/9_.PDF. To order a copy of this Public Law, contact the “The Bill Room” at the State House at 609-847-3905, and they will mail you a copy upon request. 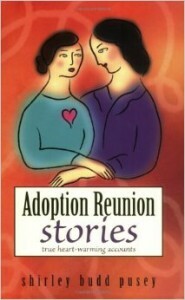 To view the State of New Jersey, Department of Health Vital Statistics information on this New Records System for Birth Parents and Adult Adoptees please log onto: http://www.state.nj.us/health/vital/adoption. 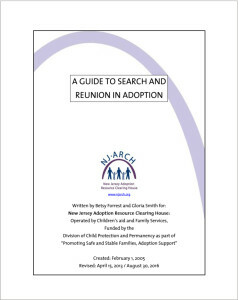 To read the February 4th and 5th 2018 NorthJersey.com article entitled “A Quest for Answers: New Jersey Adult Adoptees’ Search for Birth Parents” click here. PLEASE NOTE: This information contained on this page is intended informational purposes only. While we make every attempt to keep information current and up to date, information contained on this website may not be completely error-free and should not be relied upon exclusively for the purpose of making decisions. 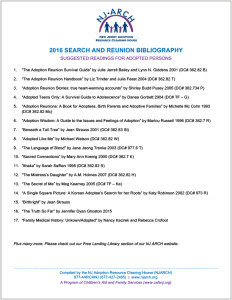 Check out these books and videos from the NJ ARCH free Lending Library! 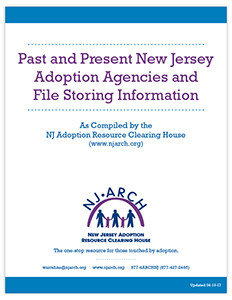 Note: These resources are provided to NJ residents free of charge as a service of NJ ARCH. 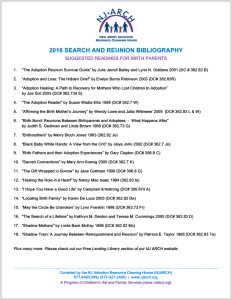 For books and articles on search and reunion or other related topics, please check out our free lending library at http://njarch.org/library/ and select “Advanced Search” for a list of topics. For information on local resources including mental health professionals, adoption support groups and more, click here. For more adoption-related website links click here. Haven’t been able to find what you are looking for? Please contact our Warm Line at 877-4ARCHNJ (877-427-2465) or e-mail us at warmline@njarch.org.